GONÇALO AMARAL - BRITISH MEDIA SMEAR CAMPAIGN: Martin Brunt Before He Was Gagged Spoke Of Gerry McCanns Missing Sports Bag..Large Enough To Carry A Small Child. Clarence Mitchell Denied Gerry Ever Owned Such A Bag ! Martin Brunt Before He Was Gagged Spoke Of Gerry McCanns Missing Sports Bag..Large Enough To Carry A Small Child. Clarence Mitchell Denied Gerry Ever Owned Such A Bag ! Police want to trace a blue tennis bag allegedly taken from Kate and Gerry McCann's apartment on the night Madeleine went missing. Detectives think the hold-all could have been used to carry Madeleine as she was taken away, or even to transport the three-year-old's body. It belonged to the girl's father but has not been seen since the night of May 3, according to a Sky News documentary due to be broadcast on Cristmas Eve. Expert Tony Rogers, who reviews unsolved cases for British police and worked on the Soham investigation, said: "If it's a bag of a size that could be used to take a child away from the flat, that would be of great interest to the investigating officer." 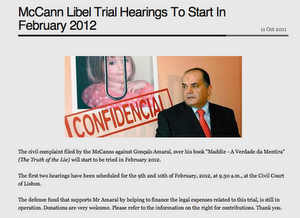 But McCann family spokesman Clarence Mitchell flatly denied that Mr McCann had lost a bag during the family's holiday. He said: "As far as Kate and Gerry are concerned, there is no missing tennis bag. They came back from holiday with everything except of course, tragically, Madeleine." Mr McCann told friends yesterday that he did not take any tennis equipment to Praia da Luz, and did not own a blue tennis bag. But Sky News stood by its story, which it said came from sources who had travelled to the resort after Madeleine's disappearance. At the time of the disappearance maritime police told fishermen and boat owners to watch out for anything unusual they spotted in the sea around the coast, including any black bin liners which could have been thrown into the water containing potentially vital evidence. 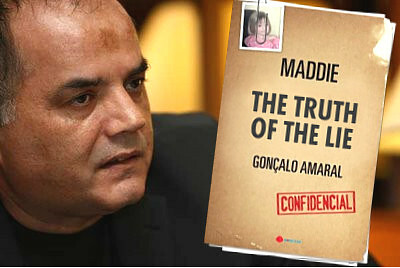 Portuguese police worked for several months on the theory that Madeleine died in her parents' holiday apartment and that her body was somehow transported to a hiding place after her death, but have been unable to find sufficient evidence to prove such a claim. Forensic samples which they hoped would prove her body was transported in her parents' Renault Scenic, hired 25 days after she went missing, proved inconclusive. Her parents have always denied any involvement in her disappearance and Mr Mitchell called the theory "ridiculous".